Have you ever looked at some finished or nearly finished embroidery and realized that you made a mistake that needs to be repaired? It may seem daunting, but this tutorial will show you how to take out a section of stitching while keeping your work secure. The reasons to remove stitches vary. Perhaps you changed your mind about which embroidery stitches will look best or you realized that you used the wrong color thread. Maybe when you look back, you wish that you had fixed a few stitches along the way. It's best to do this right after you've stitched an area, but how do you remove stitches in the middle of your work without the rest of the stitches unraveling? It's a lot easier than you might expect because the process is similar to starting and ending a thread. Before you can replace any stitches, you have to remove the ones you don't want. The first time you do this, it will be a little scary. In fact, if you've put many hours into your work, it will probably be frightening. Take a deep breath and get ready to rip some stitches. A seam ripper works well for this, but tiny embroidery scissors will also do. Look at the stitches you want to remove as well as where they are connected on the back of your work. Rip or cut through a stitch on the front of your work. Do this in a location that is either in the middle of the section you are removing or close to where stitches are secured on the back. 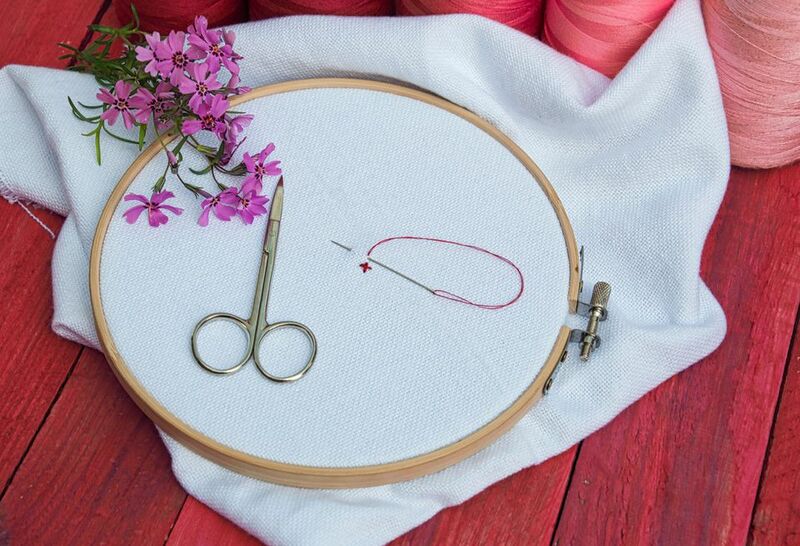 Once you've cut one stitch, use the end of the seam ripper or scissors to start unstitching your work without slicing more stitches or cutting off the thread. Remove as much of the stitching as needed, keeping the thread in one piece as much as possible. If you are removing a large section of embroidery, you may need to trim some of the loose thread away so you can undo the stitching easier. Just make sure that you have at least an inch of thread tail still attached because you'll need that thread! If you cut the stitches in the middle of the section you're removing, you should end up with two lengths of loose thread. Each of these will need to be secured. Cut threads that are semi-anchored will get some extra security too. In the example above, the long yellow thread is from the ripped stitches. The short yellow thread is semi-anchored in the teal stitches. As you work the new stitches, take care that they are catching and securing the loose thread. This may require that you move the loose thread to keep it along the line of stitching. Once a thread is secured for at least an inch (a longer length is better), you can trim the extra thread. 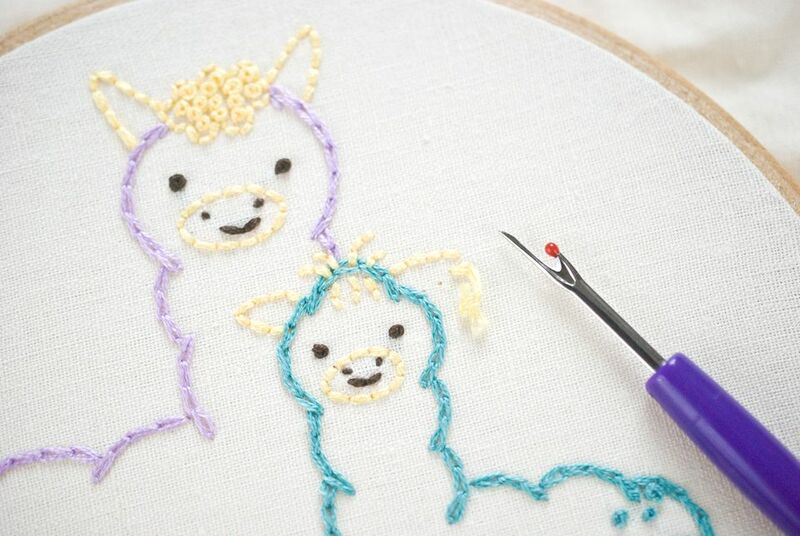 When you have two loose threads, secure one piece first and trim it, then stitch over the other length of thread as you continue your embroidery. In areas where a cut thread is semi-anchored, wrap your new working thread around and through the old thread and the back of other stitches. This will help hold it in place. If you're worried that short threads might come undone, especially in embroidered items that will be laundered, add a tiny dot of fabric glue to the back of the work near the end of the secured thread. Just be sure to do this when you are completely satisfied with your stitching because the glue is very hard to remove. This process might seem overwhelming the first time, and you may be tempted to just leave those stitches as they are. But once you get the hang of replacing stitches, you'll be so glad that you took the time to get your embroidery just right!